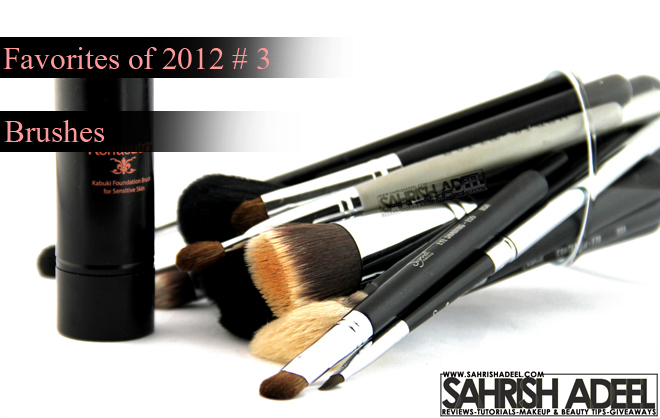 Brushes - Favorites of 2012 # 3 | Sahrish Adeel - Malaysia based Pakistani Beauty & Lifestyle Blogger! I don't own highly professional brushes yet but a few from my collection have been doing a great job for me, giving me the best possible results for now. From my personal experience, I would just say that even if you are a beginner, try to invest in best possible brushes since practicing on bad quality brushes will never help you improve your skills. Ronasutra's kabuki brush. (review here) This brush is just perfect for powder foundation and finishing powder when you don't need full coverage. I love it more for its softness. Sigma's F80 flat top kabuki brush is a great brush for liquid and cream foundations. It gives a flawless finish and helps to achieve light to full coverage quickly. Luscious' big blush brush is my all time favorite brush to apply finishing powder. I also use it sometimes to apply powder foundation for light coverage. Sigma's E40 tapered blending brush is the perfect brush to apply concealer under the eyes and then to set the concealer with a powder. It works perfect with cream, liquid and powder products. It gives such a beautiful finish. Sigma's P86 precision tapered brush (review here) is specially made to apply concealer under eyes and in small areas of the face for flawless coverage. It surely works great without going harsh on skin. I love to use it when I have a bit more time and I want full/heavy coverage. Stila Cosmetics' all over eye shadow brush has been in my use for a long time and it works great to set concealer & foundation in areas where a big brushes might not reach. 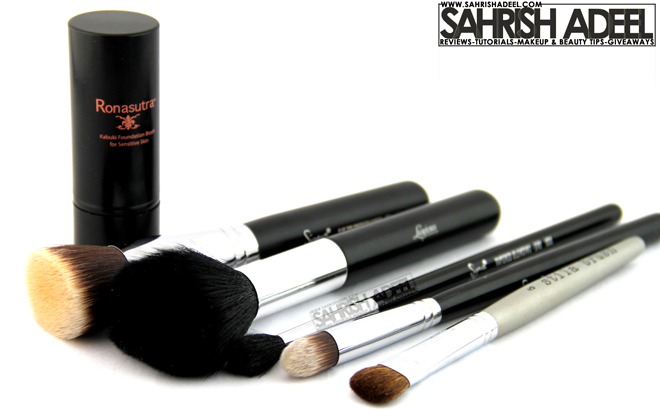 Sigma's F30 large powder brush works great for blush application. It is a good brush for powder or cream blushers. Sigma's F40 large angled contour brush works great for contour and bronzing the face and neck. Femi Cosmetics' angled brush (review here) is a perfect brush for highlighters. It does not over do the application as highlighting is quite a sensitive step in makeup application. There comes Sigma's F40 tapered blending brush again. I bought extra one of this for precised contouring. Contouring the nose with this brush makes a huge difference. Luscious Cosmetics' angled brow brush is such a nice brush to fill up brows and even to smudge the brow pencil. It is stiff enough to give nice and sharp lines. Femi Cosmetics' flat eye shadow brush (review here) has a really good size to place the eye shadow on the lid and it is soft to blend the harsh lines as well. Sigma's F70 concealer brush is made to apply concealer but I only use it to place eye shadows on eye lids. It is stiff and small sized for precise application and packs the eye shadow nicely. Mineral Hygienics' full shadow brush (review here) is a great brush when you don't want to use so many brushes and only want a neutral look. You can say that it is a combination of a blending and eye shading brush. 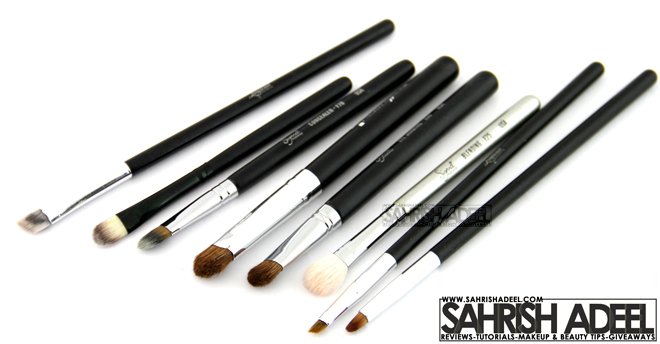 Sigma's E55 eye shading brush also works like Mineral Hygienics' full shadow brush. It is a bit smaller so I also use it to highlight brow bone and to put dark shadows in crease line for a softer finish. Luscious Cosmetics' angled lip brush might be for lip product application but I use it for gel, liquid & powder liners. It is a very fine brush and since it is smaller and thinner, it gives precise application and a really nice winged eye liner. Luscious Cosmetics' pencil brush works really nice to blend the harsh lines really precisely when you don't want to touch the rest of the eye makeup with a big blending brush. It is also a really nice brush to place the eye shadows under waterline. Sigma's L05 is just a perfect and must have lip brush. The best thing about this one, after good application, is that you can close it and you don't need to be afraid of the product to stick to the rest of the brushes or to your makeup kit. Femi Cosmetics' lip brush (review here) is soft but it gives precise lip product application. You can buy Luscious Cosmetics brushes anywhere in Pakistan or buy them online from their online website here. For Sigma brushes, check out this link here. Don't forget to use 10% discount coupon code from right sidebar of this blog. I hope you are enjoying the series. Click here to check out the rest of the posts in this series. Stay tuned to more posts in coming days. Do leave your comments if you want me to do a detailed review on any of these products and I will do a separate post.